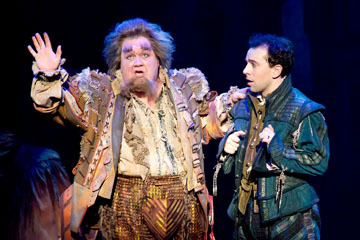 SOOTHSAYER Blake Hammond, left, and Rob McClure, as Nick Bottom, appear in “Something Rotten!” at the Ahmanson Theatre. It’s time for FOTFL and laughing out loud again — non stop. Something Rotten has music and lyrics by Wayne and Karey Kirkpatrick, and book by Karey Kirkpatrick and John O’Farrell. The show tells the story of brothers Nick Bottom (Rob McClure) and Nigel Bottom (Josh Grisetti), two playwrights in the 16th century stuck in the shadow of that Renaissance rock star, Will Shakespeare (Adam Pascal) — a real rock star complete with back-up boys and ardent fans. When a soothsayer (Blake Hammond as Nostradamus) foretells that the next big thing in theater involves singing, dancing and acting at the same time, the Bottom brothers set out to write the world’s very first musical.